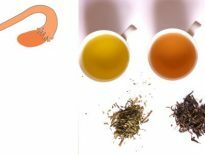 Tea is probably the most famous drink in the world and people have been drinking tea for centuries. And of course, people needed something to make their tea in and that’s how teapots came about. 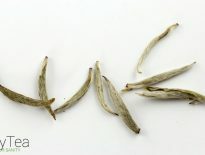 Tea leaves are steeped in a teapot, using boiling water and that’s how you get the delicious infusion that is tea. The teapot was invented in China and although the Chinese have been drinking tea for centuries, the oldest teapot was dated back to 16th century. In 17th century, tea, along with teapots, came to Europe as a luxury good and it became a big hit. At first, tea was reserved only for the upper class because it was very expensive, but during time it spread all over the world and became our favorite drink. First teapots were very simple in design, the Chinese ones were usually blue and white and hand painted. Although all teapots have basic parts like the body, spout, handle, lid, and foot, over time people got really creative with teapot designs. Nowadays, you can find hundreds of different shapes, designs, and colors. In a way, some teapots became small works of art and their design can go from incredible, crafty, and artistic, to simply weird, bizarre, and quirky. But the good thing is that you can find a teapot that matches your personality and interests perfectly because there’s basically a teapot for every taste. The more unique teapots can be great for tea parties because you can show of your quirky side and present something interesting for the guests to talk about. So take a look at these 18 teapots that are both incredible and weird in their design. These flower shaped teapots are really intricately designed. At first glance, it’s hard to recognize that they’re actually teapots and not some home accessory, although they definitely will liven up every room they’re in. These teapots are more classically shaped, but they have these amazing flower applications that look really delicate and cute. If you want to have an elegant and classy tea party, these teapots will definitely fit in. These teapots are also classic in their shape and very elegant but the difference is that they’re made out of glass which is very unusual. They look very sophisticated and expensive and everybody can see the delicious contents of your teapot. One of the most famous tea parties is definitely the Alice in Wonderland mad tea party. Since this great Lewis Carol book is very eccentric and surreal, Alice in Wonderland inspired teapots are no different. Everybody loves this classic tale and these teapots definitely bring a smile to one’s face. Also, the three spouts look very cool, although it does seem like they might be a bit hard to use, but everything is possible in the Wonderland. Teapots with classic shapes can be a bit boring, so somebody thought a pillow would be a great shape for a teapot. These square-like teapots definitely look a bit quirky and different but they’re still very functional. They can also be a cute accessory for the kitchen. Teapots are made of materials that preserve heat and make your tea warm for longer periods of time. But why not be extra safe and add some cute knitted covers to your teapots to keep that warmth and also make your teapots look very cozy and cool. This way, you can add some personality to your teapots but these knitted covers can also protect your fingers from a very hot teapot. An octopus is a very strange animal with its many tentacles, so why not put that design to use? Tentacles can be spouts, lids, handles or even serve as foots of the teapot. There isn’t much connection between an octopus and tea, so this design can seem a bit strange, but it’s definitely unique. Do you want an unidentified flying object to bring you your tea or an alien to pour it out of its gun? Well, apparently you can get that. This super weird alien teapots are unique, to say the least. Who would have ever thought that a flying sorcerer would be a perfect shape for a teapot? Or a big, green blob with a gun? But there you have it, if you’re a UFO fan I bet you’ll love these! When talking about the 60s, many people think of the hippie generation; their music, their fashion, and of course, their famous VW vans. 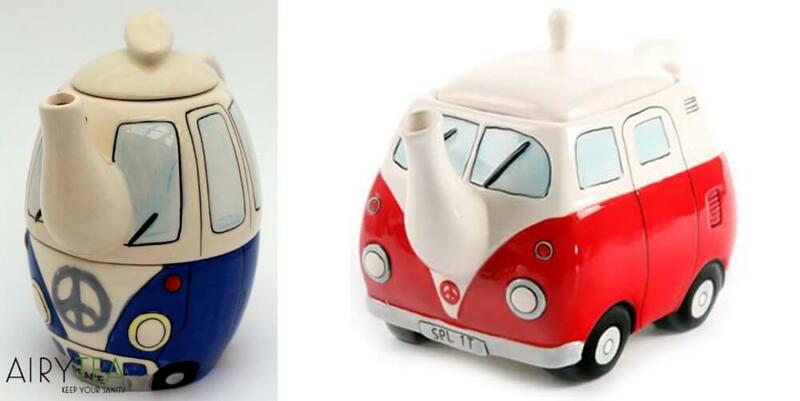 This iconic vehicle is still popular to this day and it’s no wonder its design ended up on teapots as well. I’m sure all hippies or fans of the hippie movement will love this one! Teapots that look like machines and appliances? Yes, that exists as well. Here you can see a sewing machine teapot, a toaster teapot, a typewriter teapot, and it’s hard to decide which one is funnier. It would definitely be very fun pouring your delicious cup of coffee out of these quirky teapots and the guests would surely be surprised. Steampunk is a genre of science fiction that combines the design and technology of 19th century and its steam powered machines with futuristic design. That’s why stempunk style is also known as retro-futuristic. It is known for its intricate design and these teapots definitely prove that. They look really cool and have all these little bits and pieces that make them look really fun and unique. These wood teapots are simply incredible and jaw-dropping. Real artistry is required to make these and to carve the wood in these amazing shapes. These teapots look so organic and natural and could make great accessories for the home because they look like works of art. 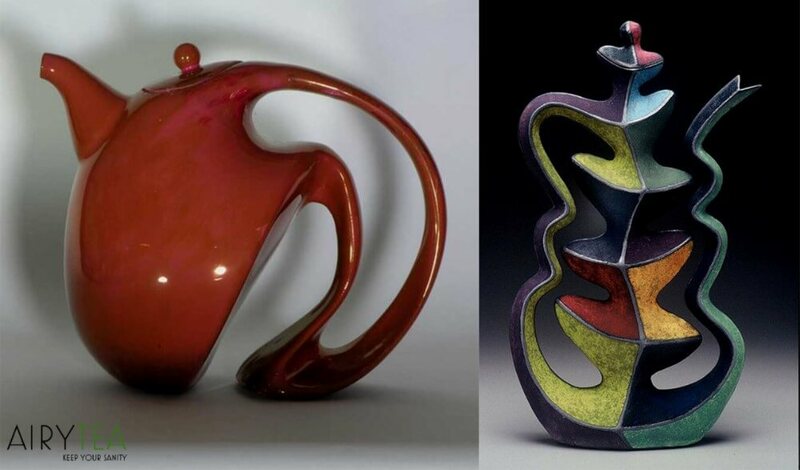 These teapots were inspired by art, paint, colors and they look really special. The colorful paint dripping effect makes it really aesthetically pleasing and unique. The middle one is actually designed as a paint brush which is not something you see very often. These teapots look like sculptures at first glance and they were probably designed by a sculptor. They will definitely be very appealing for all artists and art lovers because you can use them to make yourself a tasty cup of tea and also use them as works of art and have something beautiful in your home. These teapots also look like works of art and are very sculpture-like. They look like they were made by an artist who loves surreal type of sculptures. The design of these teapots is very unique and they can serve as teapots as well as little works of art in your home. Salvador Dali is a Spanish painter, writer, designer and film-maker. He is known for his surreal art style and particularly weird paintings. But the really weird thing about him is that he’s apparently a big inspiration for teapots design. 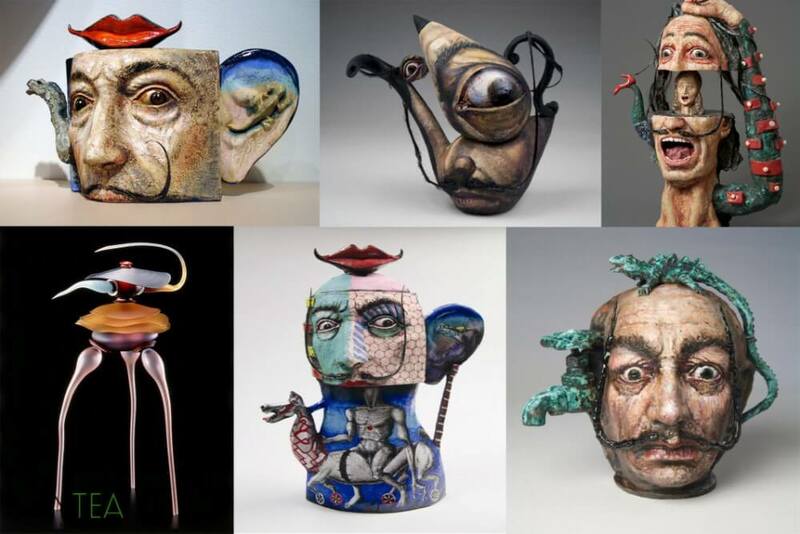 These teapots are extremely bizarre and surreal, just like Dali’s works. These are really far away from regular teapot shapes and designs and they are so weird you could just stare at them for hours. These teapots have so many weird details and shapes that look nothing like the parts of a teapot. Simply…surreal. Salvador Dali is not the only person who’s an inspiration for teapot design, Marilyn Monroe is a big one too. But unlike the Dali inspired ones, the Marilyn teapots are much more subtle. They use a very classic, clean, teapot design with only the most famous Marilyn features. When you see luscious red lips and a beauty mark next to it, you immediately know that this teapot is inspired by Marilyn Monroe. This one is really simple, but cute and girly. Another famous woman in history is definitely Mona Lisa, the inspiration for the famous Da Vinci painting. We all know that mysterious smile and look that captivates you. So apart from being a famous painting, Mona Lisa’s face can also be used for teapot design. These actually look pretty cool, and since the value of the Mona Lisa painting is extremely high and nobody will have the opportunity to hang it on their wall, you can at least have these cool teapots to show your love for the famous painting.